After the heat of yesterday, and a hot night, hot enough for a mosquito attack, the weather this morning was a shock. What I thought might be early morning mist was actually low cloud. Initially it was just damp but by lunch time it was a proper wet day and the rain didn't stop until about four. 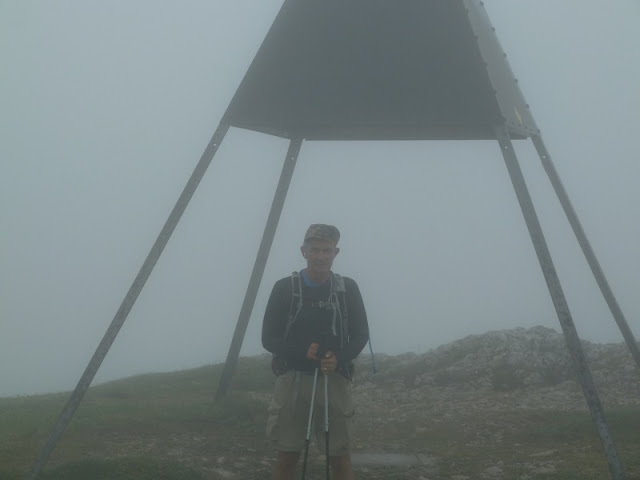 Shame about the weather because it was a big walk, 30 kilometres and 8 and a half hours walking. The day started well as the chef at the Hotel wouldn't let me pay for my sandwich, a huge one, which made me feel better about paying extra for a room of my own. He had the radio on so presumably had heard the weather forecast and was feeling sorry for me. Good food at the hotel, absolutely enormous portions. I suspect that this would have been a top walk had it not been for the weather. After an initial walk through trees there is a long middle section which is open countryside. 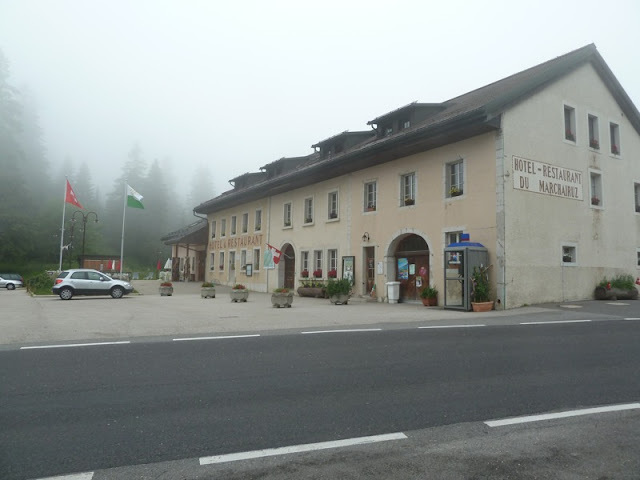 The highlight would have been Mount Tendre (see below) which is either the highest or one of the highest points on the Jura Ridgeway but today it could have been anywhere. Another highlight could have been an unexploded shell which warning signs seem to suggest are scattered about this part of Switzerland. If it's foggy like this all the time no wander they can't find them. 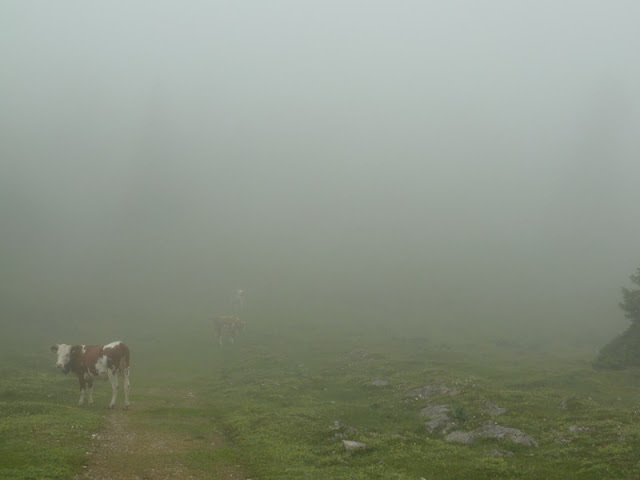 There are an enormous number of cattle on top of the mountains at this time of the year and in the fog the sounds of the bells clanking all the time is a bit eery. Warning signs tell you that cows will protect their calves so, along with exploding shells, this is makes for dangerous walking. 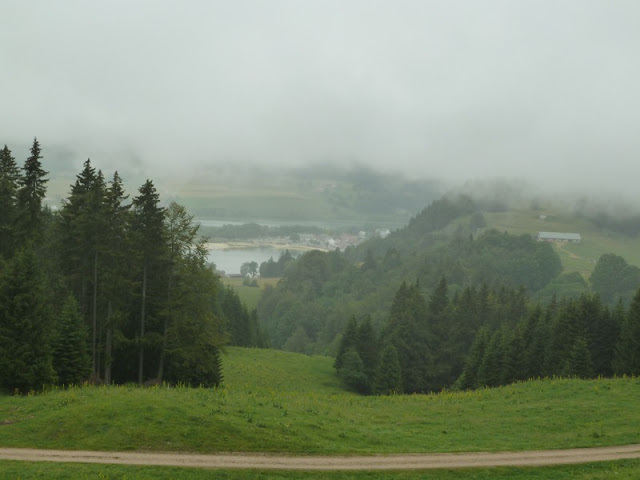 The walk stays high for a while and then drops down to Le Pont and onto Vallorbe, the mist started to disperse but the rain got worse. Technically the walk seems to take you into Le Pont and back out again but I resisted the delights of that detour. 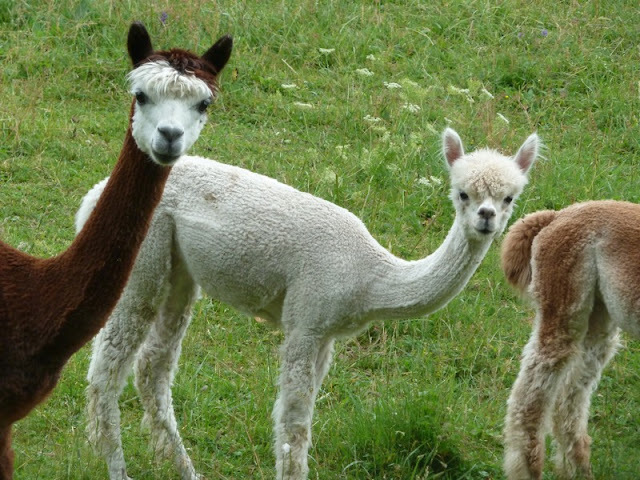 An unexpected pleasure was some baby Lamas in a field. They looked ridiculous, something a very small child would get a great deal of pleasure from, must find out if there any near Brighton. The really bad news about today's walk is that my feet wear got very wet and the room at the hotel smells of damp dog. I have placed them on the window ledge hoping that they might act as a mosquito repellant. Switzerland was not involved in any war since Napoleon occupied the country in a few days, and not in any revolution since 1848, so unexploded shells must have rusted away long ago. Or maybe the signs meant some other danger? Sweat attracks mosquitoes - in fact it is how they get aware of us, their food. So boots with sweat in an open window will certainly attrack mosquitoes, unless they consider the weather too cold to go out. Considering what you write about fog, this may have been the case. Cows and calves - a theoretical danger as long as you keep your senses and do not try to be a matador after such a long time in Spain!